In 2008 I argued that the best way to solve WoW’s third party gold selling problem was to sell gold themselves. They had lost the ability to control their own in game economy and the best way to fix that would be to crowd out the third party markets making it not worthwhile for the hackers and bots. At that time, I didn’t even suggest to exchange that purchase for more in game time but I did suggest you support the buyer with a lower subscription fee. That would balance out the developer greed of inflating the in game economy further. While I did not envision the WoW token it was a problem that needed to be solved back then. And here we are, with it solved in WoW. Destiny 2 is now also facing this problem. I have two of my character classes in the mid 270s and at this stage I can only improve my character by grinding super hard for the fraction of a chance for a fraction of an increase, join a clan and tackle very challenging end game content, or stop playing. I instead moved to my third character slot and have my Warlock in the mid 200s meaning I have another week of playing before parking my characters and waiting for DLC to arrive. I have (and keep) mentioning how frustrating that is considering the way the market is and how a game like WoW realized how to engage the casual core by making content accessible. Destiny 2 opted against that for the weakest of reasons, that they were worried it would create ‘toxic’ behavior. Clearly, if WoW can have Mythic+10 PUGS not go toxic so could Destiny with a little bit of effort. I keep making that argument because I am still not buying it. And instead of an average game with amazing mechanics I believe D2 could be an amazing game with amazing mechanics. A little bit of investment and effort would help that. Of course, what Destiny 2 takes away from the casual player base is now being monetized by third parties. Whether or not this marketplace would exist with accessible content is anyone’s guess s- but the truth is WoW gold selling websites now sell gold for more than Blizzard does – meaning the market shouldn’t exist, isn’t profitable, and has been successfully neutered. I don’t care enough about the game to invest on third party sites to see the content, but I do care enough about the game to wish they would do the right thing and provide that content to their customers. Only 11% of the player base has been in a raid. Their “guided games” feature will not improve that. It should be 80% – which they will never hit. In my WoW RMT article linked at the top I admitted I bought gold. I was raiding hard and didn’t have the time to grind the gold to get the mats to build the things I needed to raid effectively. That is a work/play balance WoW had wrong back then. Good games learn from mistakes (theirs and others) and it is not too late for Destiny 2 to add matchmaking to their more challenging content. The base content has ZERO challenge and I think they would be surprised at both the quality of their player base and their ability to play the game as intended with matchmaking. They have specifically stated this will not happen but I hope with all the negative feedback they are getting on this issue they will reconsider – even if legacy content is added with new DLC or some way to get the players playing the game they paid for. There is not a reasonable argument to not have your game’s content easily accessible in a walk in the park game like Destiny 2, and it may even encourage and support in game RMT purchases. You mean like LFR difficulty? Are you advocating more ways to get power or just experience content? Or raid tier diffuculties? Destiny 2 refuses to provide matchmaking for hard content, although they have matchmaking available for everything else. You have to make your own group. Which I think is pretty silly, considering the base content is laughably easy. So there is a lot of content – a lot of good content – that most players won’t see. 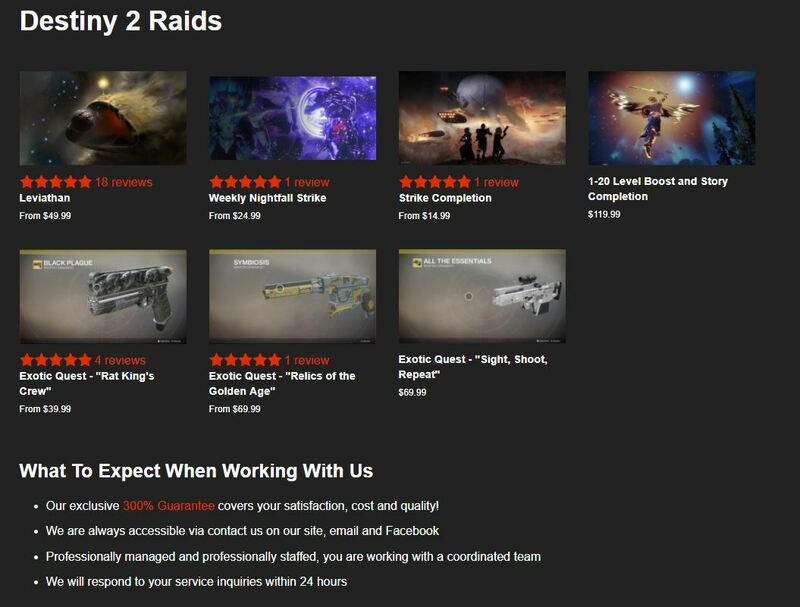 (early stats show only 11% have seen a raid so far). LFR style would be fine – a bit easier, a bit less rewards, with the options for people to move up as they get the gear and experience levels (exactly what WoW did with their Mythic dungeons and raids). I strongly feel there is no excuse to not have your content available anymore.